Keep updated on ULMA Construction’s latest developments as well as the most relevant projects we have worked on. Located in the financial centre of Peru, this commercial tower measures more than 90 m in height, making it one of the tallest buildings in Lima. It features 27 floors aboveground with cutting-edge design, along with nine stories belowground covering 82,401.32 m². Situated at the Staten Island Ferry Terminal, a 20-minute boat ride from Manhattan, Empire Outlets is set to become the retail centrepiece of New York City. Forming part of Mexico City’s transportation infrastructure development plan, this viaduct reaches 227 m in length to connect the residential and commercial area Interlomas with the Naucalpan-Toluca Motorway. The new addition to Jaworzno III Power Plant, Poland, will boast a 910 MW production capacity. Measuring 19.2 m in width, this mine tunnel is to become the widest on the entire Iberian Peninsula. Before assembling the multidirectional BRIO scaffolding, there’s been undertook a detailed technical study of the unique building geometry, so as to adapt to it as efficiently as possible. Riyadh is a Saudi Arabian city that – like any big city anywhere in the world – is home to a high density of vehicular traffic. An underground rail network was built in order to reduce traffic and improve both access to and communication between the city centre, the airport, and the financial district. A series of buildings are being constructed along the banks of the Hudson River with spectacular views of Manhattan. The Harborside Tower was designed with 69 storeys, 763 residences, and a total height of 214 m. It is now the tallest residential building in New Jersey. Traversing challenging terrain, the development project along the Málaga—Los Curos Motorway will improve transportation between the regions of Boyacá and Santander, Colombia. The central element of these improvements is the Hisgaura Bridge, stretching 653 m in length with a single span reaching 400 m, will become in 2018 the longest cable-stayed bridge in South America. Meticulous study and planning paired with careful ULMA product rotation provided for optimal performance and a reduction in the tasks necessary to perform in situ. A new sarcophagus was built to confine radioactive leakage from the abandoned Chernobyl reactor complex. The New Safe Confinement (NSC) is an arched structure of concrete and steel measuring 150 m long, 257 m wide, and 109 m tall. The Polish infrastructural development plan has drastically increased the number of new civil engineering projects being undertaken nationally. ULMA Poland team is currently finishing various bridges with the in situ cantilever method, most notably the MS-4A Bridge over the Oder River and the MS-30.1 Bridge, spanning across the banks of the Drwęca River. The Eschborn industrial park is slated to be home to the headquarters of various multinational corporations and government agencies. As part of an effort to spur local economic development, two significant office buildings are being built in the southern part of Germany, one of which is the 'Bauteile, Management Circle und Zühlk', featuring more than 10,000 m² of total space and a car park for 200 vehicles. Chile has more seismic activity than any other country in the world, a fact that makes construction regulations not only extremely strict but subject to continual revision. The criteria set out in regulations must be followed for all construction projects in the country, regardless of the building’s final purpose. Atlantic Station Mixed-Use Development, U.S.A. The Atlantic Station Project will transform the old Stamford, CT Post Office building into a mixed-use development with spectacular views of Manhattan and Long Island. The complex comprises a dynamic retail and restaurant area set underneath two tower blocks reaching 21 and 29 storeys tall, respectively, as well as a car park for more than 800 vehicles. The new water treatment plant in Prague is the biggest project in the Czech Republic currently underway, and when completed will be the largest facility of its kind in all of Central Europe. ULMA has offered rapid, simple, and, most importantly, flexible solutions for this project composed of extremely diverse slab thicknesses and heights. Within the frames of road investments planned in Poland to the year 2020 the number of bridge-type works made with the use of the incremental launching method has substantially increased. ULMA has recently undertaken the design and delivery of a special formwork which allows applying the incremental launching technology to construct two bridges: MS-6 viaduct on the S5 road and the E-1 Bridge on the S19 road, located in Poland. The versatility of the formwork structures provided a solution both profitable for our client and efficient for the construction of the octagonal piers required in Mexico – Toluca Intercity Train project. The Fondazione Prada Museum, designed by the architect Rem Koolhaas, attempts to integrate traditional and avant-garde architecture in a single space. This video represents the latest development in ULMA media communications, following closely behind the publication of Construction Book. With compelling audiovisuals and illustrative graphics, both productions convey our identity, our values, and our way of working. When more than 2,000 t of material is mobilised, when extremely versatile construction systems are needed, and when the speed and simplicity of assembly is crucial, experience is absolutely fundamental to success. In an area that houses the country’s principal business and financial headquarters, this new tower is built to LEED Green Building certification standards for greenhouse gas emissions and efficient resource use. From the second to the thirteenth floors there will be four offices per storey, and from the fourteenth to the twentieth, only two. ULMA presents its new general catalogue, Construction Book, with more than 250 pages featuring extensive information covering the entire product portfolio, including formwork, scaffolding, and bracing systems, along with descriptions of more than 70 projects executed around the world. The publication of this document coincides with a comprehensive update of the systems exhibited in the Showroom. All of our latest product developments are already on display so that the customer can get to know the latest market releases first hand. The impending Olympic Games in Brazil are transforming the metropolis of Sao Paulo, with marked effects on the city's road network. In the southern part of the city, the “Chucri Zaidan” urban plan includes various real estate developments, as well as infrastructural projects providing roadway, environmental, and social improvements. 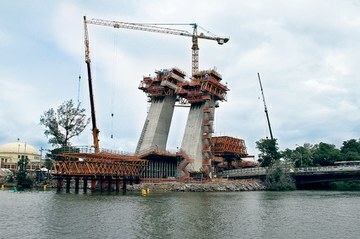 As part of this plan, two new bridges – Laguna and Itapaiuna – were built in the district of Marginal Pinheiros, and ULMA took part in both projects. With an investment of R$305 million, the bridges will greatly ease traffic both to and from this historically congested area. ULMA accompanies each client from the start of every project until its final construction, studying the options for each site, designing the technical solution for formwork and scaffolding and providing the most suitable construction material, together with the safety systems that help to prevent possible incidents during the construction on site. Every year we develop new and improved products, the quality of which clearly demonstrates the effectiveness of close collaboration with our customers. This is the way to remain on the cutting edge of research, creating ever-more advanced and efficient scaffolding and formwork systems, tailored to both customer and market requirements. The commencement of operations for this project will meet the entirety of domestic demand, wholly supplanting imported fertilizers. The plant is anticipated to produce 756,000 tonnes annually. Twenty per cent of production will be for internal markets, and 80% for export. The products made from these raw materials will improve crops, increase soil productivity, and recuperate depleted land. ULMA Construction designed the new SBU Safety Platform to provide an optimally efficient, versatile and safe building solution, allowing our customers to work with wall formwork at any height in complete and guaranteed safety. As part of the infrastructural improvements planned for the 2016 Olympic Games, Line 4 of the Rio de Janeiro Metro will extend 16 km to connect the city from west to south. In addition to relieving traffic congestion, the metro will be capable of transporting 300,000 passengers daily and will reduce their transit time from 2 hours to just 15 minutes. 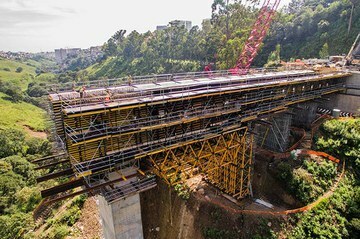 Never before has a self-climbing system been used to build inclined pylons for a cable-stayed bridge in Latin America.